I don't think I've ever properly reviewed an Ilona Andrews book. There are just some books that are too precious for me to mangle with my clumsy review words. :) I also think that their books are probably some of the few I can think of where the female protagonists are as strong as the love interests and totally make me crush on both. Hurray for spreading the IA love! I see good review after good review for this author's books - I really need to make this the year I finally try one! I am so disgusted with myself for still not reading this author. I really need to stop accepting so many ARCS and just read a few books that are highly recommended. This sounds exciting and I love that there are so many great characters and that it has depth! I don't know whether to start with this series or her Magic books! 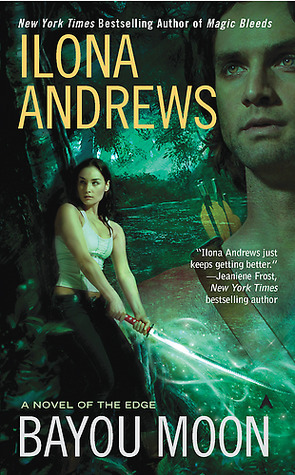 I think you know, this is my favorite individual Ilona Andrews book. I freaking adore it. So of course this review makes me happy. BUT I have to say I never thought about how Cerise differs from all other Andrews heroines. You're so right! She's the only one of them who isn't pretty much alone in the world (other than maybe Dali, not sure she counts), and her family was one of the main things I love about her. From reading what you're sharing, I think I'd enjoy reading about William and Cerise. I'm also really curious to find out more on the family feud. Adding the series to my wishlist now. Thanks, Keertana! It's so odd that I never really enjoyed this series nearly as much as I enjoyed Kate. I just recently finished this one on audio, and while I really liked it, I never quite felt compelled to read the next two. You're right about William and Cerise, though, I loved how they learned from each other.